The old saying “Time is money” has never been more true about today’s hectic reality of leading our busy schedules. Therefore, time management tools come in very handy these days, especially if you want to succeed in your work and further develop your professional career. There are many applications and tools that can help you organize your work and personal life, in general and, of course, boost your productivity at the same time. We’ve come up with a list of top 10 ten time management tools that are easy to use and that can take your your work efficiency to a whole new level of organizing yourselves. Mind 42 is a collaborative browser-based online mind mapping tool that you can use to create mind maps in structured diagrams on your computer. This tool will help you visualize your thinking in a meaningful way. With it, you can organize your events, manage your ideas, create to-do lists, which result in better time management and higher productivity. Mind 42 is a classical desktop application which you can launch in your browser. It is private, but you can share your method of thinking publically. 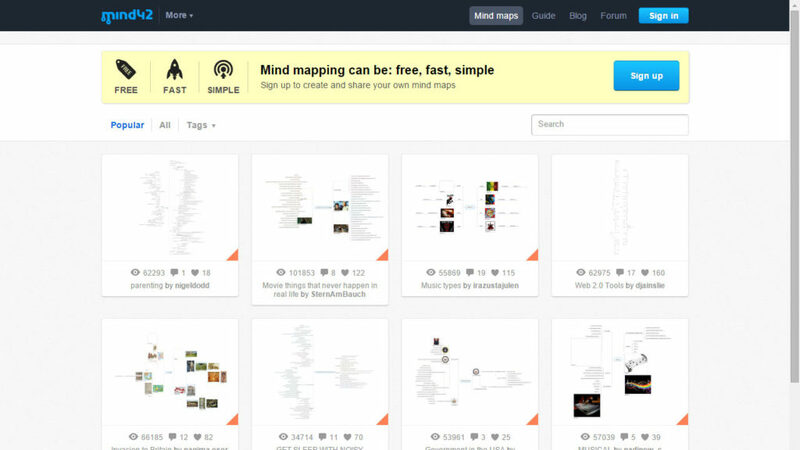 Mind 42 is a free tool. 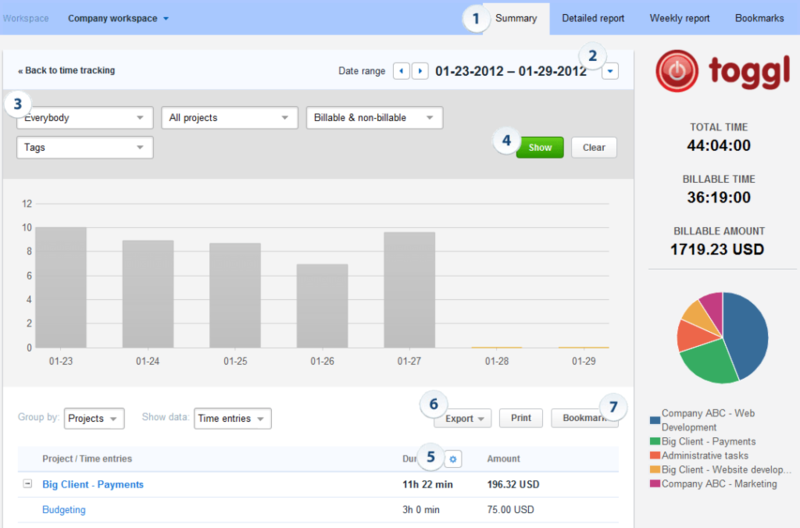 Toggl is a cloud-based time tracking application which helps you with your project management. It is an excellent tool for freelancers and small business holders alike. It has very simple functionalities. It can track time from anywhere on the Web via its browser extension. Users can export timesheets and email reports to customers or superiors. With Toggl, you can have a complete overview of your team’s work. You can see who works on what tasks, how long a certain task takes, how many hours are spent, etc. You can monitor whether your project is within or over the budget. Basically, this application contains everything you need to plan your time and resources. Mobile applications are available for Android and iOS. It has four levels of service. The first level is free and you get all basic features such as: time-tracking, idle detection, the ability to edit time tracked, the ability to work offline, to create as many projects and clients as you need, and more. It integrates with other tools such as Asana, Trello, Basecamp, etc. 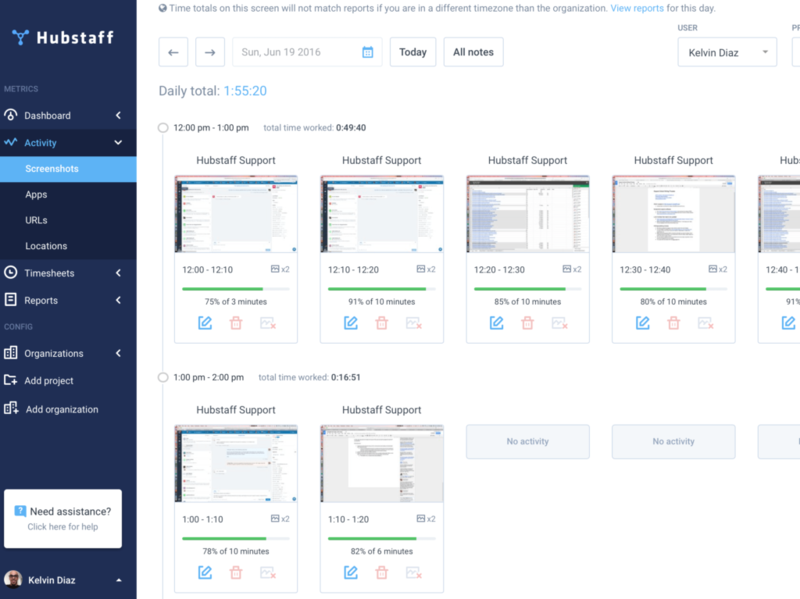 Hubstaff is another time tracking application for Windows, Mac, Linux, Chromebook, iOS, and Android. This time management tool helps companies effectively manage the productivity and workflow of their teams. Hubstaff has numerous features and it is excellent for the employers as well as the employees. With Hubstaff, you can put all your projects and all the teams that you manage in one account and organize them on a project basis. Hubstaff also takes random images of the screen during working hours and measures mouse and keyboard activities. It can support online invoicing models like the one we offer at Envoice so you can invoice your clients for the time tracked or the job done. 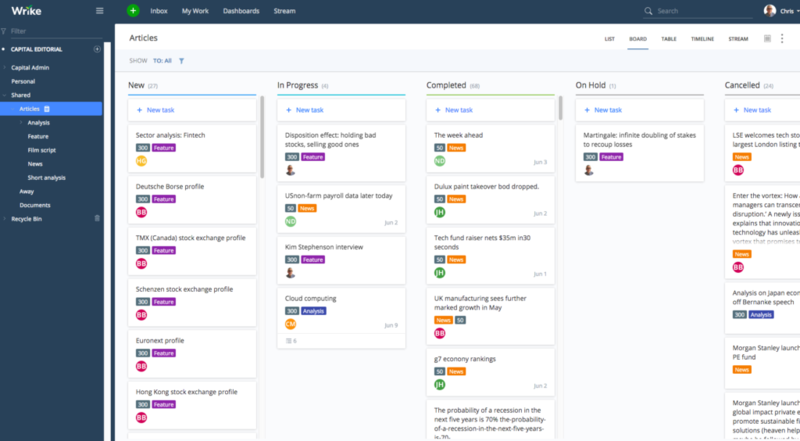 When we talk about time management tools, Trello is one of the highest ranking tools available on the market that will help you organize your time and substantially boost your and your team’s productivity. 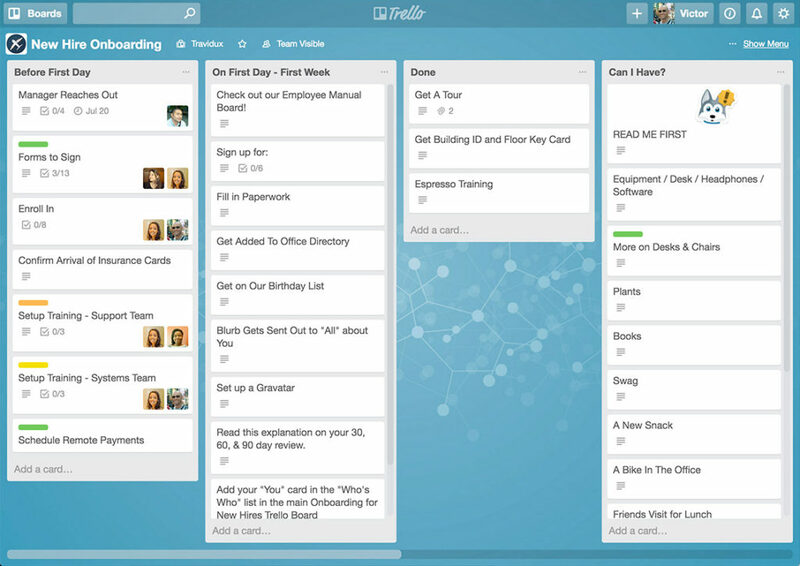 Trello is an online, collaborative workspace that is very simple to use. It operates on the principle of boards and cards. Boards correspond to the projects and card to various tasks. easy organization with tags, labels and categories. In terms of technical details, Trello is supported on Windows, Android, iPhone/iPad, Mac as well as it is web-based. They also have an amazing blog which is a must for everyone interested in getting useful tips on productivity. Wrike is the winner of Finances online best project management software award for 2017. 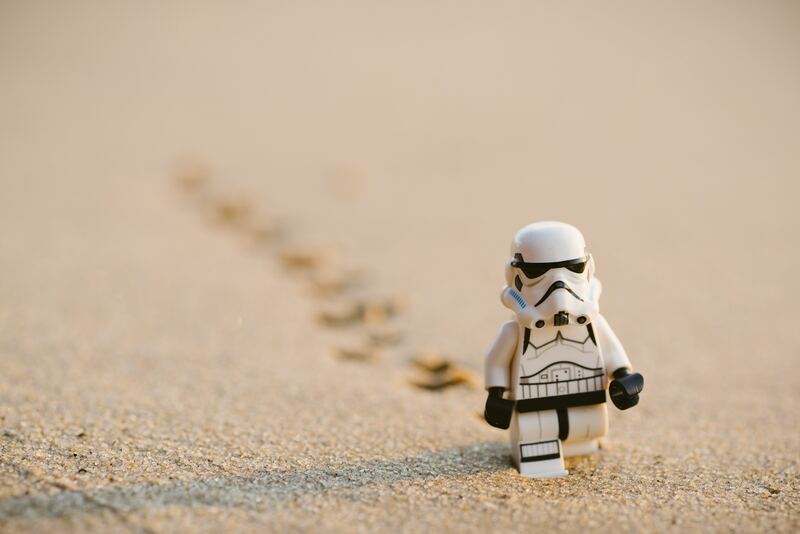 Wrike will provide you with flexibility which will improve your speed and efficiency. As a time management tool, it provides collaboration of various groups and completion of tasks from a single location. It has user friendly navigation and high level of security which means that no one without an authorization can access your databases. Wrike as time management tool also offers integration with other tools such as Google Docs, Dropbox, SalesForce, Slack, and Adobe Creative Cloud and offers open API. Asana is a cloud-based solution that is rated very highly among time and project management tools. If you have a team or a company, this tool will help you organize and manage tasks and projects in a seamless manner. Asana can be accessed on Android and iOS smartphones, laptops and tablets. Your team’s communication and collaboration will be significantly simplified with Asana and you can use it to create projects and tasks within the existing projects. The important thing is after the initial set-up, there is no need to use e-mail or other apps for corporate communication. There are many ways in which you can benefit from Asana. For instance, it enables you to prioritize daily tasks, create, categorize, and schedule projects, track the status of your tasks and projects. A very interesting detail about this tool is the smart inbox. The users will receive only important messages and updates. Asana integrates perfectly with systems such as: Harvest, WordPress, Wufoo, Usernap, Google Drive, Dropbox, Slack, and many more. TimeCamp combines features like time tracking, invoicing and billing.This app will assist you in tracking attendance, calculating billable tasks, creating invoices, time management etc. What distinguishes TimeCamp from other time tracking apps is the reporting. You can choose from 5 types of reports which you can share, filter, or export. 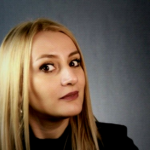 As a time management tool, TimeCamp provides automated tracking of computer usage and generates productivity analyses for each employee. 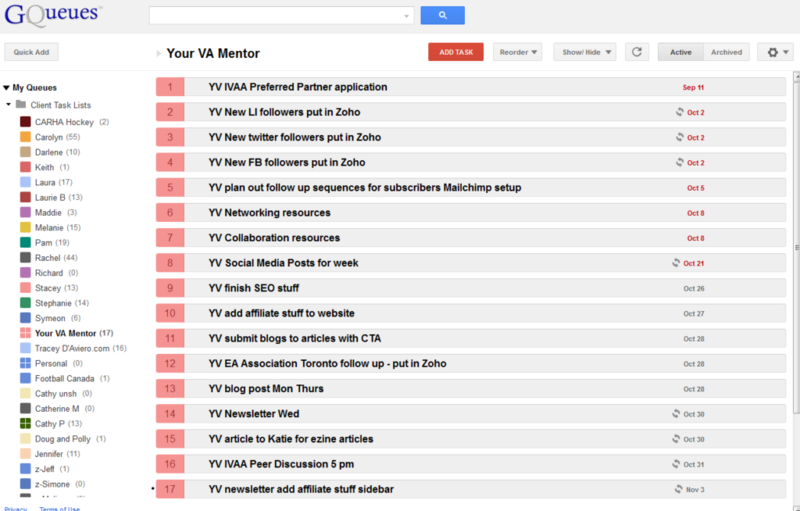 You can send emails about completed work, productive hours and lists of time-consuming websites. 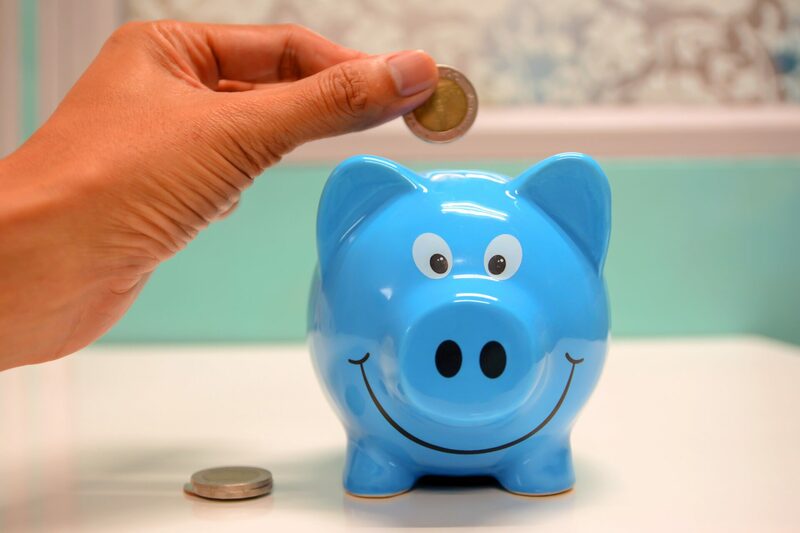 In a nutshell, TimeCamp helps you improve project budgeting, has automatic time tracking for employees and sends detailed reports on particular projects. We must also mention that TimeCamp has an amazing customer support service. You can contact the experienced professionals who are ready to answer your questions any time, from every device. Replicon is a cloud based time tracking and expense management platform that is very easy to set up and requires no training. There is no need of installing additional hardware and with its flexible client management and billing features, you will be able to manage your employees more effectively. 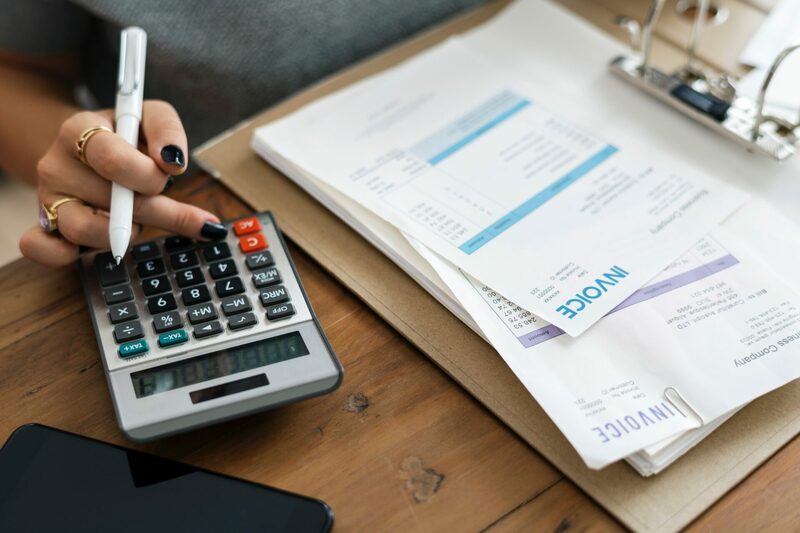 In terms of the benefits, features and strengths of the product, Replicon has timesheets that capture billable hours accurately and your billing process will be easier with the time approval system. Another useful feature coming from this time management tool is the professional service automation that will give you many time tracking options. Replicon helps you easily manage your customer and project portfolios. With the Payroll Management feature you can easily manage employee statistics in terms of absences, leaves etc. Replicon makes it very easy to monitor different project levels and the real time access to all the details makes the process much easier and clearer. One of the best advantages of this tool is its transparency. At first glance, Gqueues looks very basic and resembles the classic pen and paper task organizer. It is very popular among users of time management tools. Gqueues is available as a desktop website program and as a mobile app. In this app you can create tasks and assign due dates; create task categories. 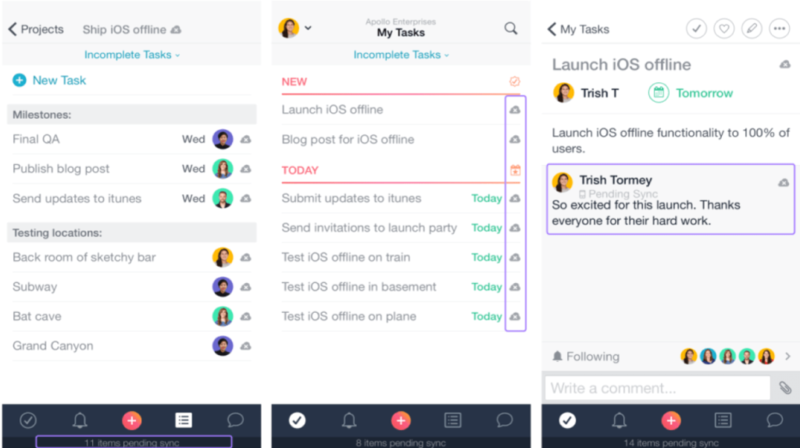 You can also share your task lists with other. The modus operandi of this time management tool is simple. You create a task and after that task is completed it is checked off the list and moved to an archived list. With Gqueues, your tasks will be better organized through a system of categories, queues, and tagging. Gqueues integrates perfectly with Google apps including Google Calendar, Google Drive and Gmail. Do you want to improve your productivity and efficiency? Do you want to get your work done without being distracted? RescueTime is a tool that enables all these things and even more. It is a time management and productivity app that works mostly behind the scenes and it tracks, measures and automatically categorizes your activity. 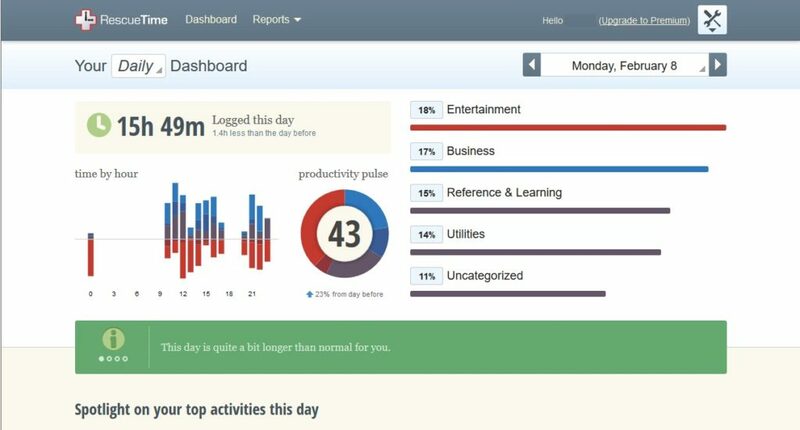 RescueTime monitors the websites and applications you use and how much time you spend on them. This tool helps you work smarter and you can improve your productivity by setting goals which will help you stay focused and keep on track of work. You can monitor your progress via the dashboard with detailed reports that show you the amount of time spent on various websites, applications and documents. RescueTime has additional features that will block distracting websites for certain periods of time and track offline activity such as meetings, calls, or commuting. None of us can afford to waste time. In business, as well as in everyday life, getting things done on time is very important. Deadlines can put a lot of pressure on us which can affect our work to a great extent. If you have problems organizing your time or tasks, do not hesitate to use one or more of the time management tools mentioned in this post. That way you will greatly facilitate your work, improve your functionality and most importantly your productivity.